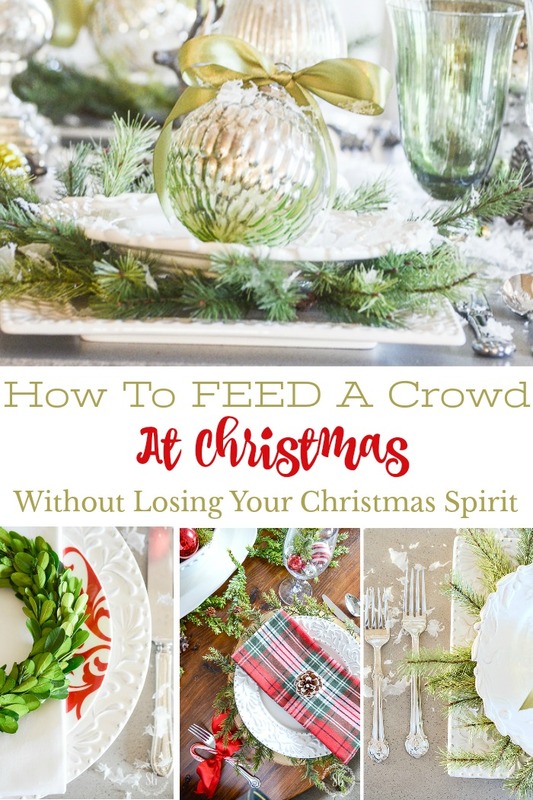 HOW TO FEED A CROWD AT CHRISTMAS AND NOT LOSE YOUR CHRISTMAS SPIRIT! Here at StoneGable, we are in full Christmas mode. This year I’m planning for lots of family Christmas day! Lots of young adults and kids and little ones. I recently got an email from a reader about feeding a crowd on Christmas day for breakfast, lunch, and dinner. And I thought many of you might be wondering about the logistics of doing that too! 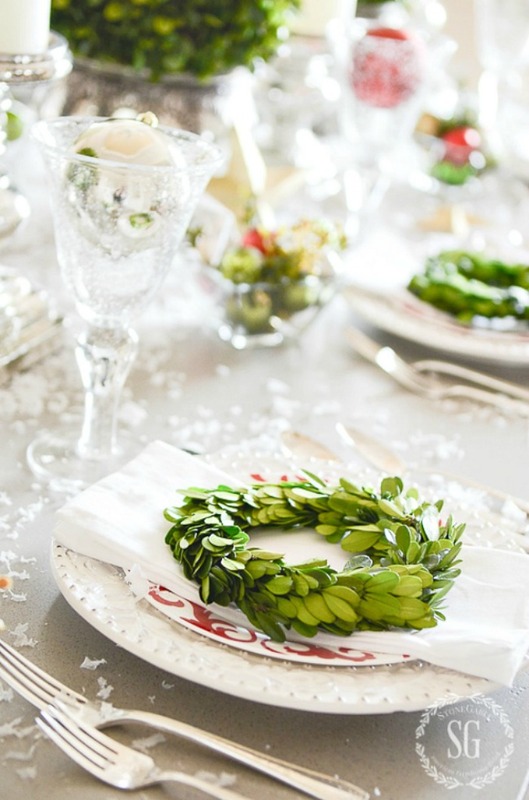 Today is Practically Speaking and we are talking how to feed a crowd at Christmas and not lose your Christmas Spirit! Well CJ I am so glad you asked! We will have 18-20 here for Christmas dinner and 10 for breakfast. There will also be other’s coming and going throughout the day. Here’s my plan for feeding my Christmas crowd and maybe it will help you. Because our numbers have gotten so much larger on Christmas day, breakfast around the breakfast nook table is not an option any longer. If you have a smaller group for breakfast I’d say use your kitchen table (if you have one) for breakfast and your dining room table for dinner. That would be the perfect scenario, but if that is not practical in your home, then the dining room table is your best option for both meals. Unless you want your family to be eating in their laps. This is not the best solution! I know what you mean CJ, about not wanting to mess up your table. And I think I can help you a bit with that. Here’s my “plan of attack” this Christmas. We have a Christmas brunch every year. Christmas morning starts early here at StoneGable with coffee and cookies (and opening one or two gifts) until about 10:30 and then we have brunch. I will be using my dining room to seat everyone. And my kitchen island will be used as a buffet. If you don’t have an island you can use a countertop of a kitchen table. Really, you can use any flat surface to set up food buffet style. I have a buffet in my dining room that works well and a buffet/cabinet in my foyer that I’ve used for food in the past. The idea is to make a pretty spread without any cooking involved! I’m busy enough and I want to enjoy my company. I often ask family who join us on Christmas day to make one dish for Christmas dinner and bring one thing for the afternoon nibbles. Afternoon food is self-serve and I let my family and guests enjoy a little nosh whenever they want. 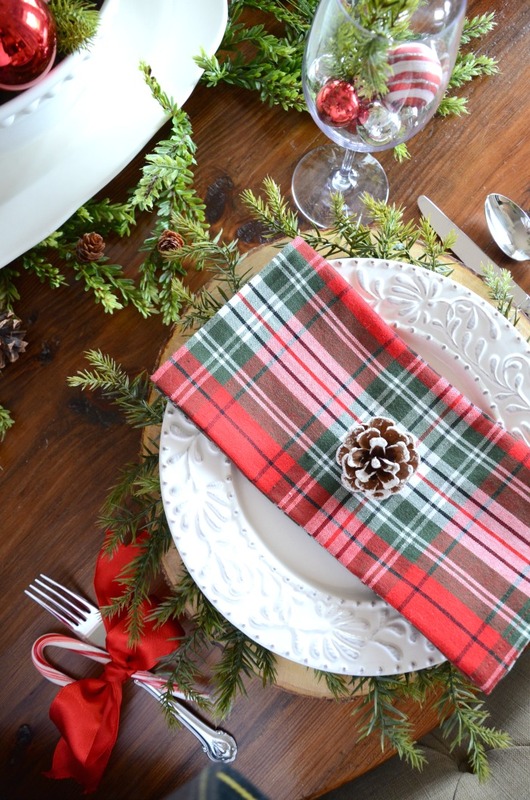 Pretty paper plates and napkins are a must! No washing dishes or napkins either! Now, let’s talk about a smart way to set the table so it can be used for breakfast and dinner and still look beautiful and clean. This does take a bit of planning and thinking through. I will not be using a tablecloth and already this solves the problem of what to do if your tablecloth gets soiled at breakfast. I have a pretty impervious concrete table so a runner will work just fine and we will be eating both meals on the bare table. Just a swipe for any spills and a wipe for crumbs and it’s ready again. If you have a table that needs table pads and therefore a tablecloth, I would go one of two ways. 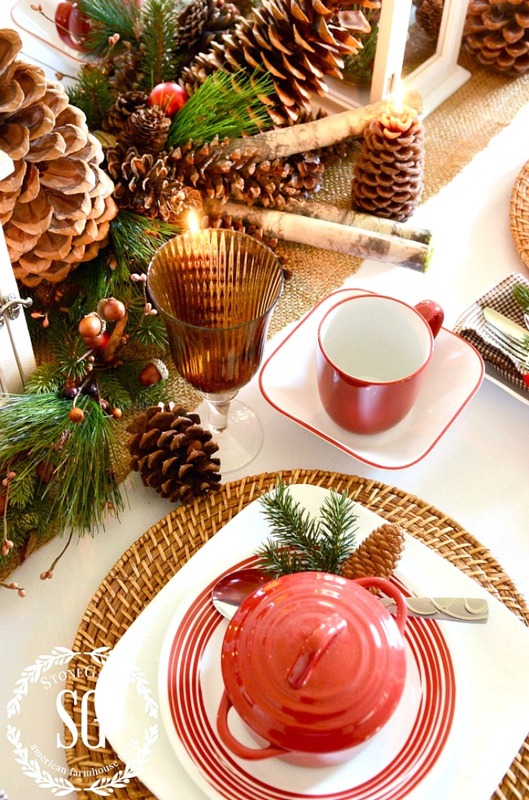 My first suggestion would be to use a white tablecloth and put pretty placemats at each place setting for breakfast. They should catch any crumbs and spills. 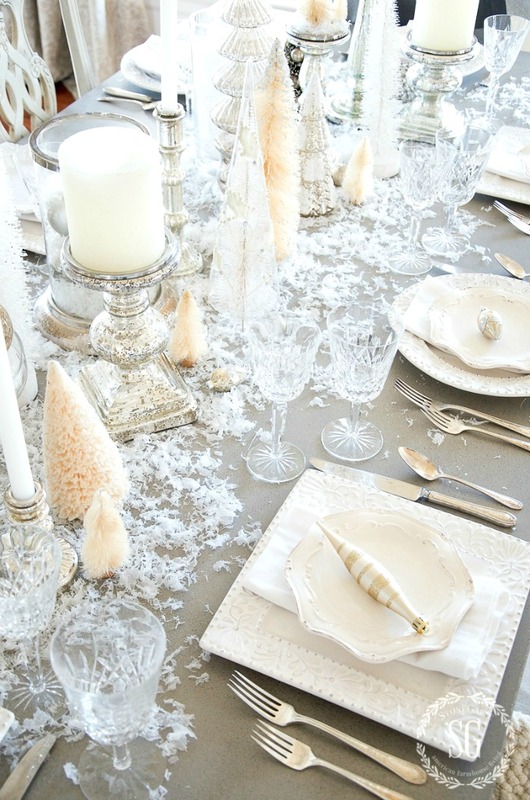 Then I would set the table for dinner using just the white tablecloth. If you are uber worried about spills here’s another suggestion. You can always double up on the white tablecloth with a plastic tablecloth as a spill barrier in between. Very smart and oh, so easy to remove the first tablecloth with all the crumbs and spills and have a clean tablecloth on your table and ready to go! As far as dishes and flatware and drinkware. I use the same ones! After brunch, they get popped in the dishwasher and put back on the table. I might add a salad and dessert dish and some pretty forks to the buffet for the dessert course but I’m not putting them on the table this year. Dessert is usually served late into the evening when the babies have been put to bed and is a casual, candlelit affair. Served from the island or dining room buffet it is usually something simple yet elegant. This year my daughter Jacqueline is making a couple flourless chocolate cakes that will be served with homemade whipped cream from a chilled whip cream canister (a very handy gadget). A simple plate of assorted homemade Christmas cookies will be served alongside the cake. Drinks are served all day from the bar in the breakfast nook and from the bar cart in the dining room. I’ve seemed to have collected a good deal of stemware so I show it off on Christmas day. I collect the used glasses in plastic dishpans and stash them in my laundry room to be washed by hand later. Now let’s talk about the centerpiece. 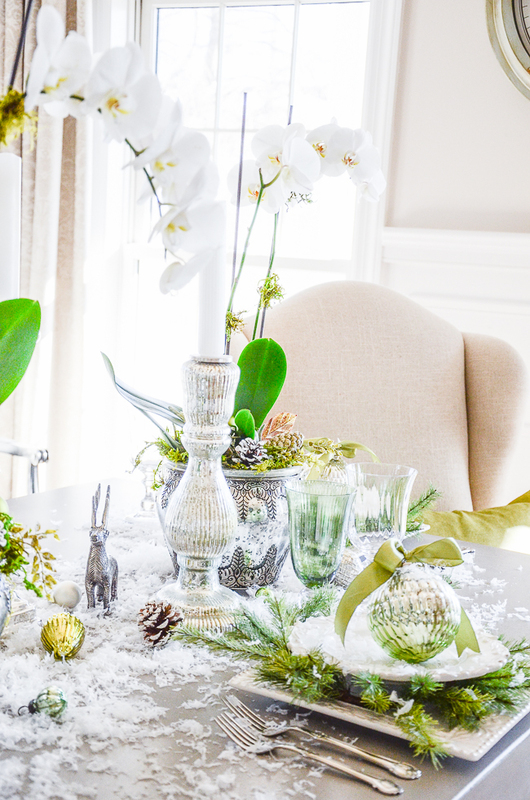 I love an opulent Christmas centerpiece. But when there are too many “moving parts” it is hard to take off for cleaning the table before the next meal and to put it back on. Because I am not using a tablecloth I can leave my centerpiece in place. So I can create something pretty and really not give it a second thought. If you need to change tablecloths KEEP YOUR CENTERPIECE SIMPLE! 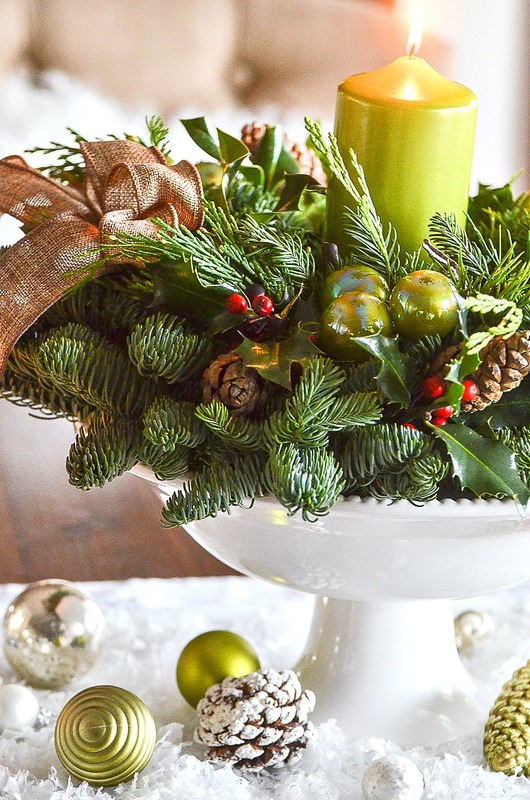 It’s easy to whisk off a pretty floral or evergreen arrangement and a couple of candlesticks and replace them. 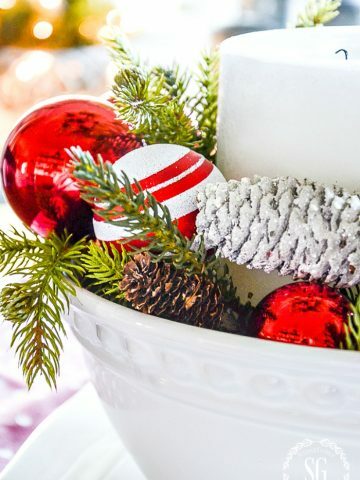 See my idea of using a beautiful large wreath and a chunky candle for the center of your Christmas table HERE. Finally, let’s talk about seating. It can be a nightmare! If you are having more people for Christmas than your table can hold you need another option, right? I know families that live in a warm climate who seat everyone out in their garage. Their garage is spotless! And I know many families with a “kid’s table”. 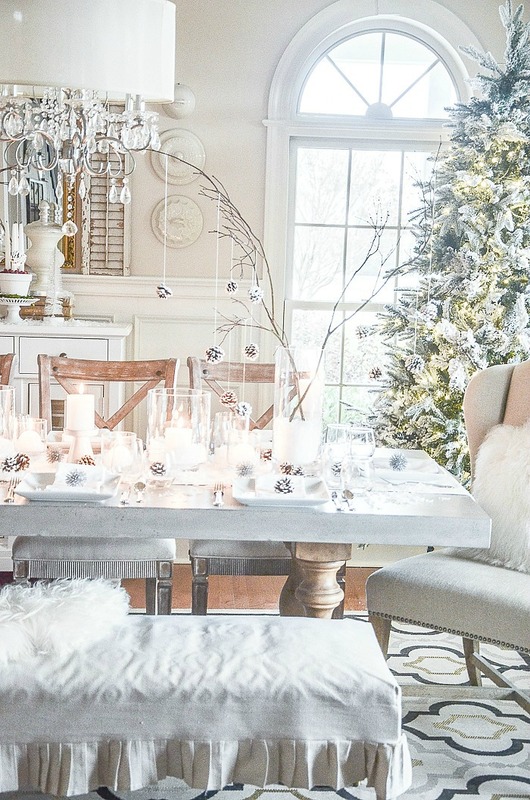 This year I’ll use only the dining room table for brunch and put up a second utility table turned Christmas table in the foyer next to our dining room for our evening meal. The second table won’t be put up until about a half hour before dinner and I’ll have lots of helping hands to do it. But I’ll have everything ready! Chairs, tablecloth (yes I’ll need one for this table), dishes, flatware, napkins, glasses, a centerpiece, and candles. I love plastic dishpans to stash and carry things so I’ll have everything that I need in them. I’m not very keen on a kid’s table. I like the mix of adult and children together (not to mention that the kid’s table can become a hot seat for chaos!) So, Bobby will probably eat in the dining room and I’ll eat in the foyer and let the rest of the family mix in. When children are excused (we let them watch a Christmas movie) any adult in the foyer can move to the dining room table to linger over coffee, libations, and conversation. I have a few fun table games for the adults this Christmas. Like all best laid plans, they often go awry! So, go with the flow! Things just seem to work themselves out, right? Most importantly, it’s not so much the table and the food as it is the love around the table and the family eating the food. Nothing is as important as making your home a welcoming sanctuary to create memories and build the bonds of family and friends. Plan early, ask for help, and enjoy your family at Christmas! Oh, I almost forgot. If you are hosting a crowd and have not read THIS, read it NOW! It applies to Christmas too! And it IS the best Christmas tip you will ever get! There you go CJ! I hope this post has helped. If you have a great way to feed your family on Christmas day we would love to hear about it. Please comment and share! 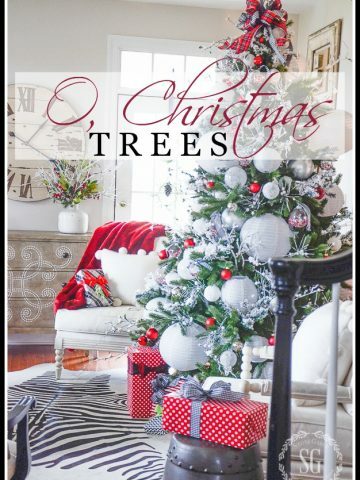 CAN I DECORATE YOUR HOME FOR CHRISTMAS? 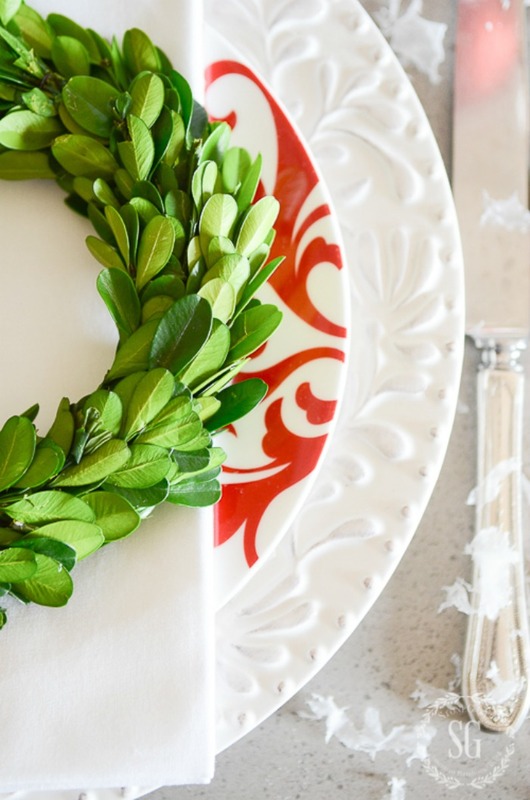 Where do you find your beautiful white dishes? The red dishes are from Pfaltzgraff and the white dishes are from HomeGoods. Hope this helps. Merry Christmas and Happy New Year! Tried the dishpan solution for clearing the Thanksgiving feast and my written directions in the dishpan my granddaughter took were confusing to her. I wrote, “clear the plates from the table and place in this dishpan.” She proceeded to scrape the plates putting the garbage in the dishpan. Hi Merry Christmas and thanks for your info. 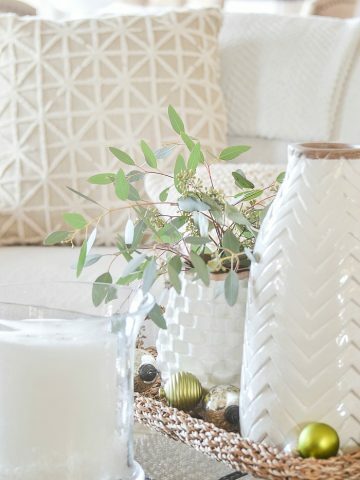 Can you please tell me where you got those small boxwood wreaths? I would love to get them for my daughter. Thanks so much. Yvonne, Thanks for the great tips! I always learn something new reading your blog! Beautiful! Can you share your menus? Hi Kathy, I’ll share them on On The Menu. Tomorrow’s post I’ll be talking about a big Christmas party we are having here at StoneGable. Merry Christmas! A drop leaf table that is in front of my window and a bench that is always behind my sofa makes seating for 4 more to add to my dining room table which seats 12. We have downs sized to a tiny home so every inch helps. I really appreciate this information, Yvonne. I’m having 16 for Christmas dinner in a very small house and I was feeling quite overwhelmed. I have planned in my head how to handle this, but to see it written down has really organized my thoughts. Many thanks for your many tips. Merry Christmas. Great ideas. My family has grown, and I’m expecting more people than ever this year. I simply do not have enough table space or chairs for everyone. . . It’s all going to be a buffet, and I’m going to remember what you said about it all working out. I know it will, but just to make sure things don’t get out of hand, I’m going to get an extra white tablecloth! Thanks for answering a question I haven’t asked yet. What great ideas! I have a crowd this year (Yea!!!) The dish tub idea is awesome! GREAT ideas! Always fun to hear what others do to handle the crowd. I have so many fond memories of going to my brother/sister in laws home with over 70 of us. Crazy how we managed but it worked out. Miss those times…so many of my sibs are grandparents and busy traveling to see their children. Great plans & great tips! As always, your ideas are wonderful. Merry Christmas! 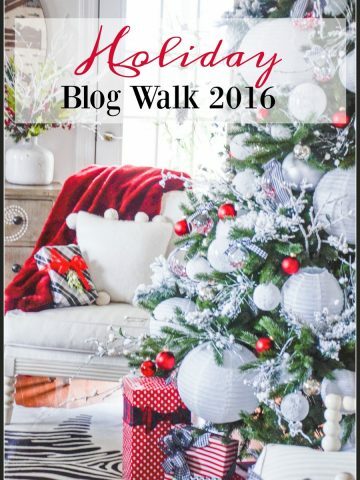 Loved reading this post, Yvonne! 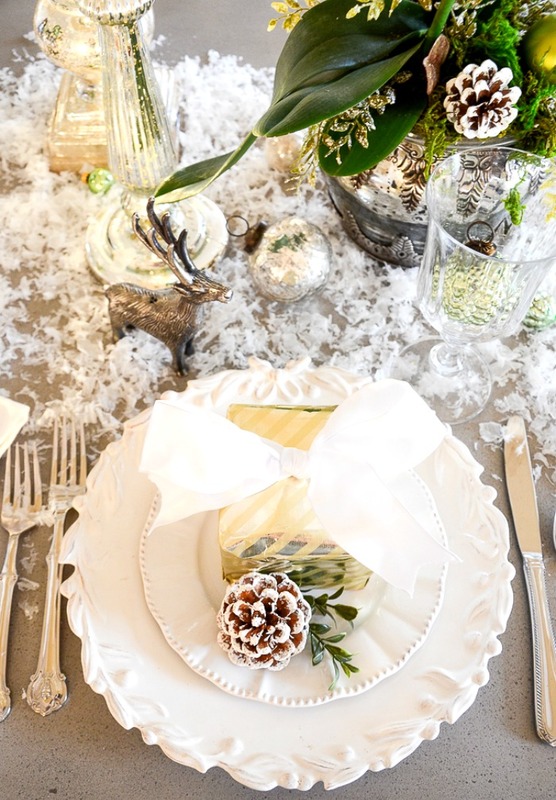 So many helpful tricks and tips, and I love your different tablescape photos, too. Hope your season is going well! Your table settings are so beautiful. I love your plan well and then go with the flow attitude. Your guests are lucky people. Love these ideas Yvonne! Thank you so much for sharing and hope you have a wonderful Christmas!! Thanks for all the suggestions for the table. I wait all year to use my Cuthberson original Christmas china so paper is NOT an option. But I do like the idea of removing dishes to the plastic pans and putting them in the garage. (If I can convince Mr. P. To leave them alone!) Like you, I want the children at the table so we will put in the 2nd extra leaf and be a bit crowded but it is worth it. Also i like the idea of the elevated centerpiece on a cake plate. That may happen. For the morning the table is a buffet and plates are carried downstairs to the family room where we do the tree. Christmas giving is a big deal with this family so it takes hours, makes a lovely mess, and requires hearty casseroles upstairs to “sustain” us! We can all rest on the 26th so we will be using all the treasured silver, crystal etc (for the dinner) and the same without the crystal in the morning. Like you I will set up a refinishing station for dinner and dessert will be its own pretty spot! Can’t wait! Sounds like you’ve got this Christmas thing down!!! LOVE your concentration on family and tradition! I really like the dish pan idea. I have a large kitchen with two dishwashers which is helpful when serving a large meal to many people. However, during a meal, using the dish pan idea, means you can enjoy your guests and load the dishwasher later. My daughter has a few other games we play. And nothing beats taking about our blessings this year. Such helpful suggestions for Christmas Day entertaining. I usually have people over from brunch to dinner, and with only one dining area, your table setting ideas will save me time and stress. 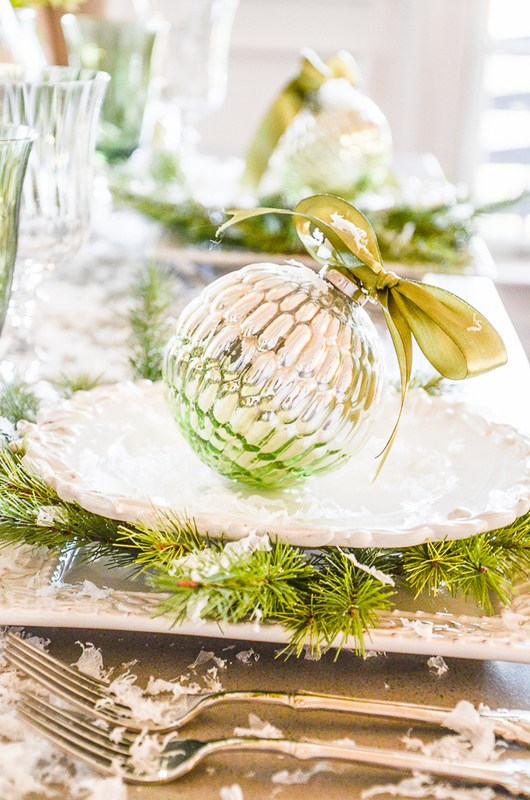 And, your gorgeous table settings put me in the Christmas spirit! Thanks, Yvonne, for your inspiration all year long. Merry Christmas to you and yours! Yvonne, thank you for all of this good advice. It was very helpful reading through it. Your page that you gave the link to with how you figured out the dishpan idea is inspired! Can you tell us what games you have for the adults this year? I think this is a fabulous idea! I have table topics, see my comment to Nancy. We also have many Christmas scramble games we find online and then print off and everyone plays. This year we are going to play, WHO AT THIS TABLE? One person at the table makes a statement and everyone at the table points to the person most fits that statement. Like: this person has the best shoes. Or this person gives the most thoughtful gifts. Or this person tells the best jokes. Or this person is the biggest Eagles (football) fan. Keep this very positive and light. We don’t want a sensitive person’s feelings to get hurt. It often is very funny. Hope this helps.